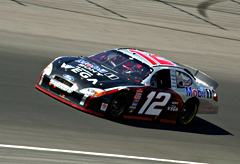 Motorsports sponsorship has many tentacles that can reach a number of audiences. Finding the solutions that best fit a companies objectives requires creativity and the experience to implement. 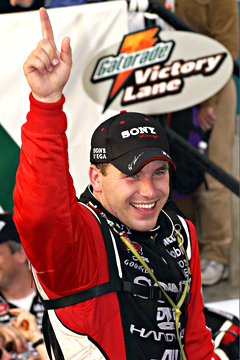 Co-Pilott has a diverse background in helping activate within the motorsports environment. 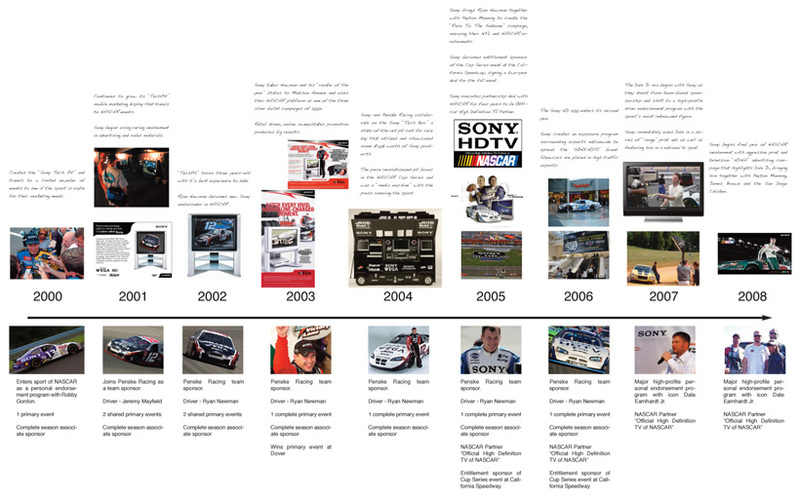 The timeline below outlines Sony's nine-year relationship with Co-Pilott within the sport of NASCAR. 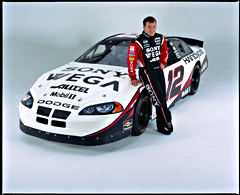 Endorsement program with Robby Gordon quickly grows to car sponsorship level. 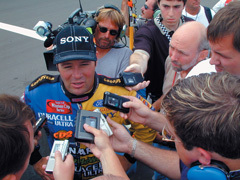 Sony aligns with Robby Gordon for a personal services contract. Creates the "Sony Tech Pit" and travels to a limited number of events to see if the sport is viable for their marketing needs. 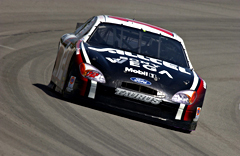 Joins Penske Racing as a team sponsor. Sony begins using racing assets in advertising and sales materials. 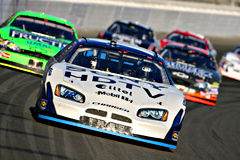 Continues to grow its "TechPit" mobile marketing display that travels to NASCAR events. 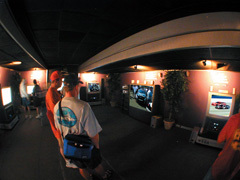 "TechPit" turns three years-old with it's best experience to date, including living enviroments to showcase Sony product. 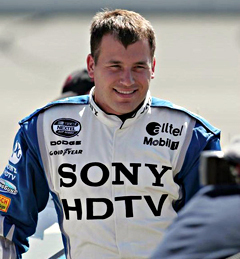 Ryan Newman becomes new Sony ambassador in NASCAR. 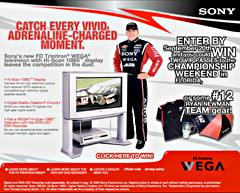 Retail driven, online sweepstakes promotion produces big results. 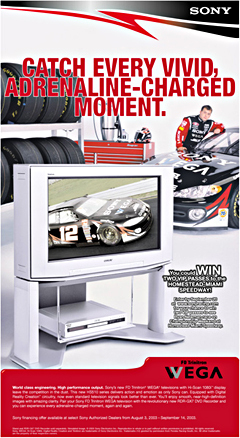 Sony takes Newman and his "rookie of the year" status to Madison Avenue and uses their NASCAR platform as one of the three silver bullet campaigns of 2003. 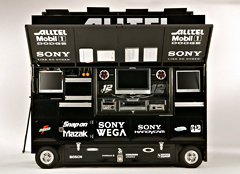 Sony and Penske Racing collaborate on the Sony "Tech Box" a state-of-the-art pit cart for race day that utilized and showcased some $50k worth of Sony products. 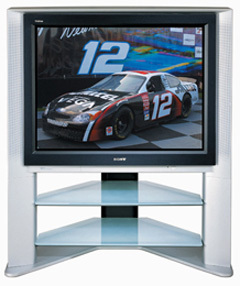 The piece revolutionized pit boxes in the NASCAR Cup Series and was a "media machine" with the press covering the sport. 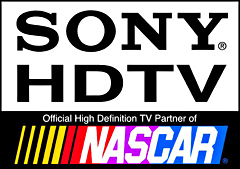 "Official High Definition TV of NASCAR"
Sony becomes entitlement sponsor of the Cup Series event at the California Speedway, signing a two-year deal for the fall event. 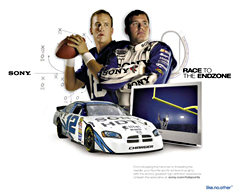 Sony brings Ryan Newman together with Peyton Manning to create the "Race To The Endzone" campaign, marrying their NFL and NASCAR involvements. 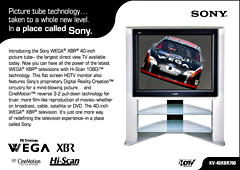 NASCAR Partner "Official High Definition TV of NASCAR"
The Sony HD 500 enters its second year. 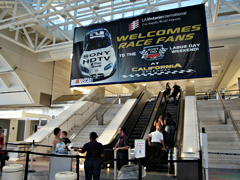 Sony creates an exposure program surrounding airports nationwide to spread the SONY HDTV brand. 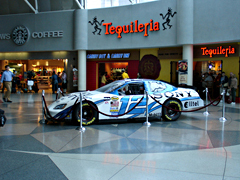 Showcars are placed in high traffic airports. 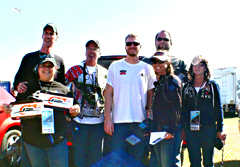 Major high-profile personal endorsement program with icon Dale Earnhardt Jr. 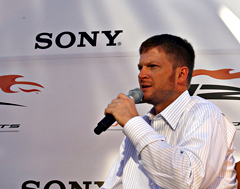 The Dale Jr. era begins with Sony as they divest from team-based sponsorship and shift to a high-profile driver endorsement program with the sport's most reknowned figure. 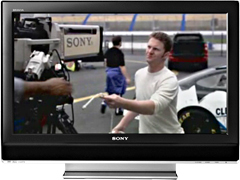 Sony immediately uses Dale in a series of "image" print ads as well as featuring him in a national tv spot. Major high-profile personal endorsement program with icon Dale Earnhardt Jr continues in second year. 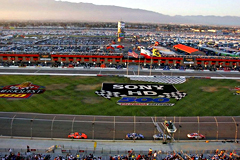 Sony begins final year of NASCAR involvement with aggressive print and television "HDNA" advertising campaign that highlights Dale Jr, bringing him together with Peyton Manning, James Brown and the San Diego Chicken. ©2019 Co-Pilott Motorsports Marketing & Management - Site By Verritech.